The Brief: Make me the martini that best represents the bar. “So, this is really it?” I asked not out of disappointment, but because I wanted to be sure Amy, our cocktail bartender at Kingston’s Kennedy Room, had received our request from another bartender. Not knowing Amy, we thought this was the perfect way for Little Spoon and I to test the bar’s classic cocktail skills without pretence or expectation if one can do such things when ordering a martini. “You asked for a martini, didn’t you?” Amy sounds unsure rather than rude. “Ah,” smiles Amy. Ideas are obviously forming in her mind. “That’s a very different thing.” If so, we can only serve the science of cocktails by allowing her to demonstrate. Amy places a glass from the fridge (pre-chilled – very sensible) on the bar in front of us. Within seconds it’s filled to the brim with ice in order to chill it down nicely. The mixing glass has also come from the fridge – a definite advantage as Amy is going to use shaved ice in her martini. Her reason for this? Shaved ice has a greater surface area and thus capable of bringing the gin down to temperature more quickly. One disadvantage is a glass at room temperature melts the ice too quickly. Keeping glassware in the fridge solves this issue beautifully. A shot of Noilly Pratt goes into the glass. Little Spoon and I nod our heads in approval without realising it, much to Amy’s amusement (there really is no better widely available vermouth than Noilly). A few swirls of the mixing spoon cools the vermouth through the ice and, once satisfied, Amy is off to fetch the gin. 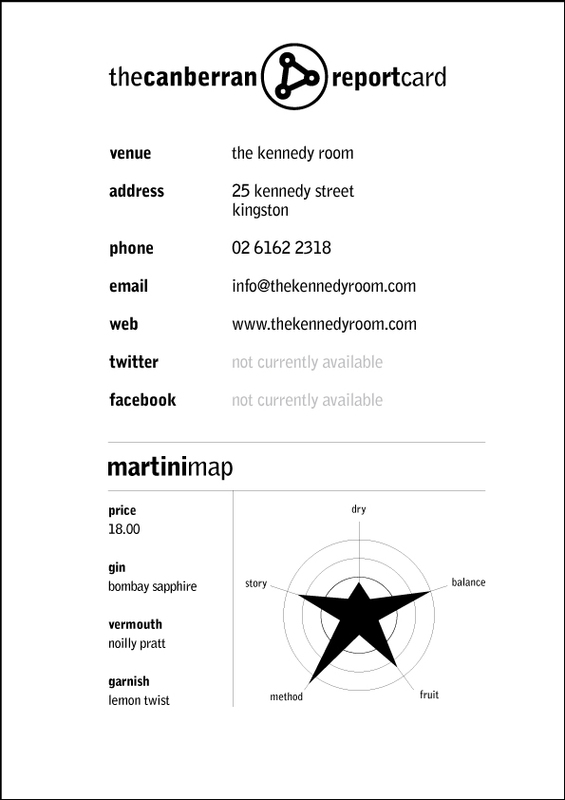 For the Kennedy Room martini, the gin of choice is Bombay Sapphire. “There are more botanicals in Bombay”, Amy explains. “It’s a little gentler on the palate.” The gin has come from the freezer so there is every chance we are going to receive a very fresh and very clean martini. Still, we haven’t made it to final presentation yet, and Little Spoon and I have seen plenty of bartenders make a mess of two ingredients and a garnish. Using a strainer, Amy explains as she pours out about 30mls of liquid. “This reduces the amount of vermouth in the martini, but also limits the dilution via melted ice. In goes the gin; an alleged 75mls delivered through a slightly generous free-pour. More stirring ensues. Once satisfied the martini mix is down to temperature, Amy tosses the ice from the martini glass and with a few flicks of the wrist dispels as much of the residual water as possible. Returning it to the bar and the strainer to the mixing glass, the gin and vermouth are delivered from slightly above the rim and right down the side of the glass to minimise any splashing. Once empty, the mixing glass disappears out of sight with a flourish. A prepared piece of lemon peel is twisted over the martini “to add citrus,” before being run around the outer rim. With a final flick of the wrist the peel lands gently in the glass as a garnish and Amy, with one hand (literally) behind her back, presents the finished product with a Voila! “This,” starts Amy, now ready to talk us through her thinking, “Is the perfect martini for a Kennedy Room customer I didn’t know.” I take a sip. It really is spectacular. Not one to drink martinis with a twist, the balance between the lemon and the botanicals is absolutely perfect. Having tasted both, Amy is absolutely right.